The Ton and So Suzy Stamps, Day 2! Good morning! Back again today with day 2 of The Ton’s collaboration with So Suzy Stamps. Yesterday‘s somewhat smart alecky card is tempered with the sweet sentiment included on this frosty snowflake card. I’m a bit under the weather, so I will keep this one short and sweet! To start, I heat embossed several of the detail layer snowflakes from The Ton’s Crystal Flurries using silver detail embossing powder in the corner of a panel of white card stock, then heat embossing the lovely holiday sentiment from Snowflakes and Friendship by So Suzy Stamps. Next, I used Soft Amethyst and Grape Crush inks together with my blending foams to blend a halo over the snowy corner of my card front, concentrating my lightest color towards the sentiment, with the darker color towards the edge. After I had completed my ink blending, I filled in some gaps with snowflakes stamped with silver Delicata ink to create a bit of dimension amongst the snowflakes, almost a bokeh effect. I cut a piece of silver glitter card stock to be 1/4″ wider than my inked panel. I butted the inky panel up to the corner of the glitter panel, then adhered them both to a plum colored card base with dimensional adhesive. The final finishing touches were some Glass Slippers sequins scattered here and there on the card front. And there you have it! To start at the beginning of the blog hop for the collaboration, start back at The Ton’s blog. To be entered to win the awesome prize package, be sure to comment at all of the blog hop stops for maximum entries. Now, for the giveaways… Up for grabs: a $25 GC So Suzy Stamps, a $25 GC to The Ton, and a fabulous Bunkie Bag that can hold your MISTI and other stamping supplies while you’re on the go! Leave a comment on the blogs by November 24, 11:59PM EST. Winners will be announced on November 25th for Black Friday Shopping!This is a fun collaboration between The Ton and So Suzy Stamps to showcase the styles of both stamp companies and the versatility of the designs of each. Each designer has created fun projects so be sure to hop along to see all the gorgeous inspiration. The hop continues until Wednesday and some of us designers will be creating and posting for each day of the hop. Be sure to follow us and check back the next couple of days to check out our collaboration projects! 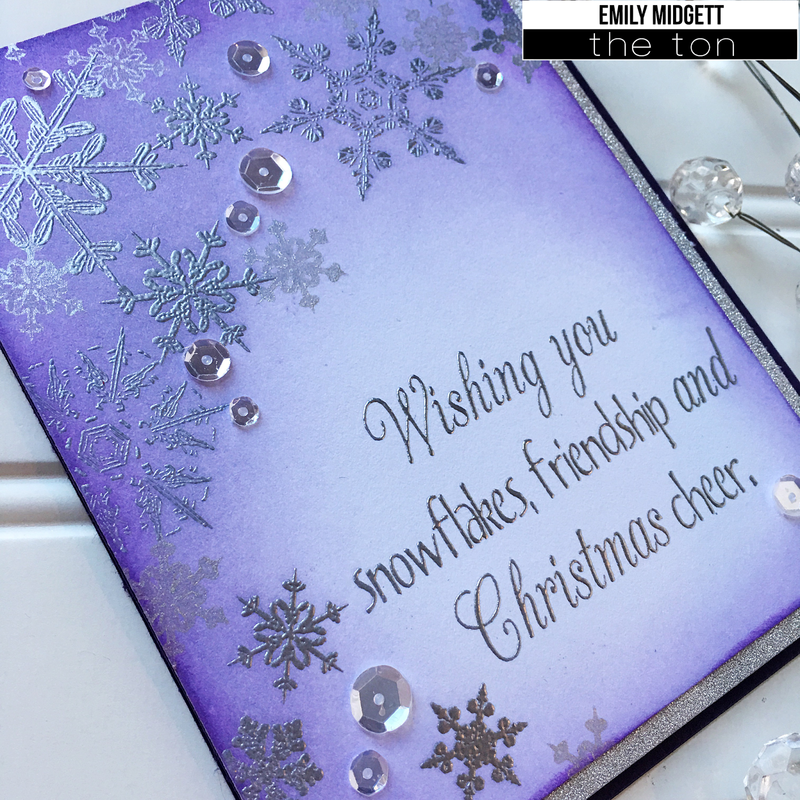 love the purple with the snowflakes embossing. So pretty! So very pretty. Love the colors. Love the soft purple and the embossed snowflakes. Beautiful ink blending love the color and the embossed snowflakes are so pretty! Great heat embossing and the shading on the background is excellent. The embossed snowflakes are so pretty. I love the purple color! Beautiful card!! Silver, purple, snowflakes-what's not to love?!?!?!? Beautiful card. Hope you feel well soon! That purple fade is fabulous and the silver snowflakes make it outstanding! Gorgeous sentiment and snowflakes on this lovely card! Fabulous colors! Love the shading around the snowflakes and how you faded out the color into the sentiment area ! Wow, that lavender color is gorgeous! That's such a great idea to create a Christmas card in these colors!